The make ahead portion of the sweet potato breakfast burrito! I don’t know about you, but it’s always a struggle to find good breakfasts that are fast, delicious and nutritious. Enter the make ahead sweet potato breakfast burrito! This is not fast to make the FIRST time, but once you have a batch in the fridge, then it’s super fast to whip one up in the morning. This is an awesome pre-hike breakfast, but I also enjoy it with lots of toppings at home for a lazy weekend morning and I often eat it before work. This is also a delicious camping breakfast. You could even bring this along on the trail in your thermos, if you’re needing a change from soup in your thermos. 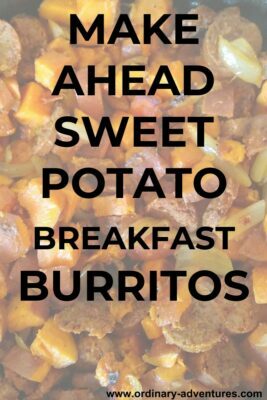 If you wanted a completely make ahead sweet potato breakfast burrito, you could make the whole thing ahead, make them into burritos and then freeze them and microwave them later. I keep the sweet potato/onion/field roast cooked mixture in the fridge and put it in the pan with a couple eggs and a bit of cheese and it cooks up in five minutes. I don’t even bother with the tortilla most of the time and just eat it as a hash (this also makes it gluten free). This is a versatile, delicious breakfast that you can enjoy any way you like! I like it with Field Roast Chipotle vegetarian sausages as written here (get them at Costco where they are way less expensive), but I’ve also made it with black beans or this awesome Cauliflower Walnut Taco meat (instead of the field roast or in addition to it) and those were both delicious. 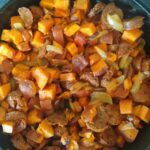 I’m sure this would also be good with Chorizo (regardless of the protein option it should be a bit spicy as that goes really good with the sweet potato flavor-trust me!). Serve with garnishes if desired! This recipe is designed to be six servings with two eggs in each serving. It’s easy to scale up or down, or you could make and eat it all at once for a crowd or family. You could make the entire thing and freeze the burritos and reheat in a microwave. I prefer to just add a couple eggs to the mixture and cook it up fresh when ready to eat because it’s so fast and it tastes better to me. I also like to add other types of protein, like cauliflower walnut taco meat or black beans. This recipe is born for experimentation. Enjoy!